Fruit offers a wide variety of flavors for a simple and healthy pancake sauce to use in place of syrup. Ripe fruits are naturally sweet, eliminating the need for added sugar in your pancake topping. 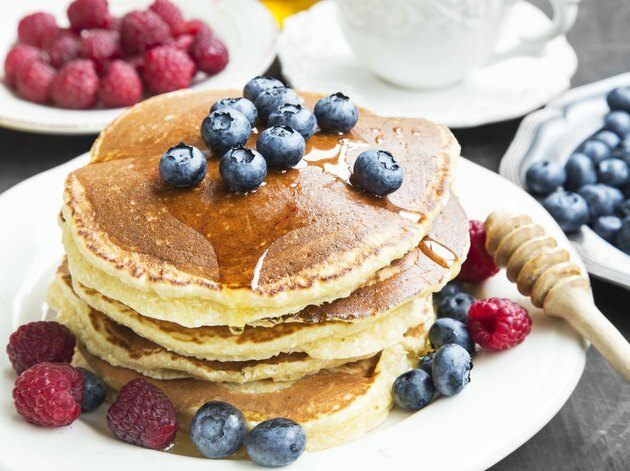 Apples, bananas, peaches, strawberries, blueberries, raspberries and oranges are just a few of the fruits that make excellent pancake toppers. Use any fruit or combination of fruits that you can dream up. Add enough water to barely cover the bottom of your saucepan, about 1/4 inch deep. Add 3 cups fruit to the saucepan. Sweeten the fruit sauce, if desired, with 1 tsp. to 3 tbsp. of sugar, maple syrup or honey. Cook the fruit over medium heat, stirring occasionally, until it begins to break down and the sauce thickens slightly, about 15 minutes. Serve the sauce warm over your favorite pancakes. Fruit that is not quite ripe may need to be sweetened. Adding sugar also helps thicken the sauce and make it a bit more syrupy. For a thicker fruit sauce without the added sugar, use 1 tsp. to 3 tsp. of cornstarch or tapioca flour. "Raising Healthy Eaters"; Henry Legere, M.D.